Former Arsenal Striker Charged for Beating Taxi Driver. HomeNewsFormer Arsenal Striker Charged for Beating Taxi Driver. A former player of Arsenal Football Club of London has been charged for an assault on a taxi driver in Denmark today. I am sure you are beginning to wonder who this could be, right? Well, it is not Thierry Henry, Robin Van Persie or Chamakh. He is a guy who used to come off the bench to score most times during his playing time at the club. Olivier Giroud? No! The one in question is Nicklas Bendtner. Some of you'll be like: "Again"? because the dude has been in the news so many times for similar acts during and after his time at Arsenal. In the most recent one, the driver was left with a broken jaw which landed him on the operation table according to Rasmus Krochin, Communications Manager for DanTaxi (the company under which the victim is an employer). It was during this revelation he said that Bendtner is the culprit and that the case has been duly reported to the police for investigation and prosecution if found guilty. 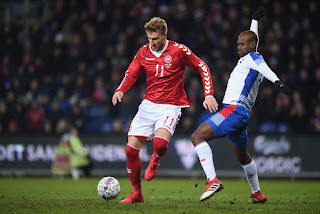 The 30-year old currently plays for Rosenborg and looks to be in the best form of his life having scored thirty-two goals and assisted eight in seventy-one games. Since leaving Arsenal on a free transfer in the summer of 2014, he has played for Wolfsburg and Nottingham Forest where he struggled for form and adequate game time.